If you were lucky enough to have been gifted or bought an Instant Pot recently, you are probably searching the internet for Instant Pot Beginner tips to get you started on the right path. Instant Pot Beginner tips ready to help you get started. 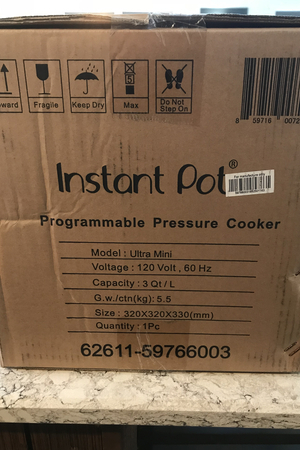 Months before I made the plunge to purchase my first Instant Pot I spent hours upon hours reading reviews on the various Instant Pot models. Which one did I want? Or more importantly, which one would best suit the needs of my family? I finally decided that on Black Friday I would purchase the 6 quart Instant Pot Duo. Then I spent the next two days filled with excitement and anticipation as I waited for it to arrive on my doorstep. I began to join several Facebook groups that are geared towards the famous pressure cooker. These are some great resources for basic questions and to gather recipe ideas. I was looking for Instant Pot Beginner Tips, but the more I read, the quicker I began to get cold feet. Searching the internet can make you very confused and frustrated. Simply reading about using the 5-5-5 method for hard-boiled eggs had me confused. I had no idea what that meant. And then there were many posts suggesting to use the NPR method instead of the QR when cooking meat. And finally, all of the posts of getting the dreaded BURN notice had me second guessing my purchase. However, when the delivery arrived, I decided to jump right in! I spent the next day getting used to my newest ‘miracle’ appliance. 4 recipes in 24 hours and I was hooked! Two years later, and now I am the proud owner of a family of Instant Pot Pressure Cookers. Yes, I have the original trio – 8 quart, 6 quart, and 3 quart. 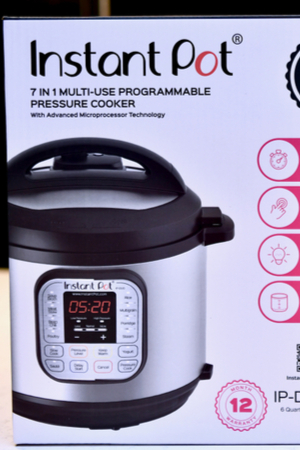 My latest addition to my Instant Pot collection – the 3 quart. Who knows, maybe the Instant Pot Max will be in my future! 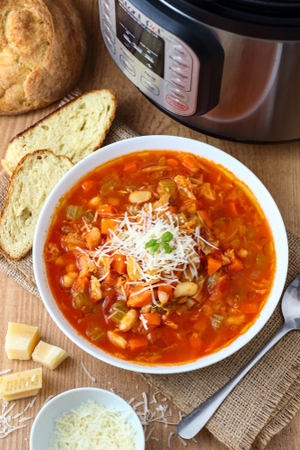 So if you are feeling a little intimidated, here are a few Instant Pot Beginner Tips to get you feeling more comfortable. I know that this sounds simple, but it is one of the most important things that you should do. You need to get familiar with the basics of how the Instant Pot is put together and how it works. It only takes a few minutes to go through the manual and it will provide you with the important features that you will use in the future. Your very first recipe should always be pressure cooked water. One of the most important Instant Pot Beginner Tips – complete the water test. Ok, maybe not a recipe, but the water test is the easiest way to determine if your Instant Pot pressure cooker is working properly. But just as important, it allows you to get used to the feel of how the components and programs work. For instance, when I first received my Instant Pot I was concerned that the sealing and venting knob was loose. Come to find out, that is normal. I was expecting it to ‘click’ into place. 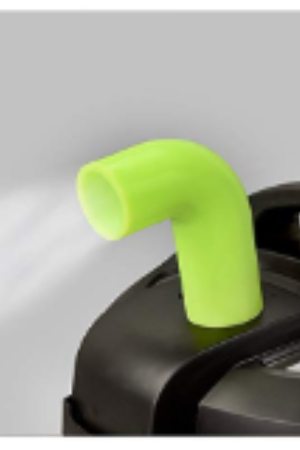 Instead, it moves freely when you turn it to sealing or venting. And when you start the water test, you will probably wonder why the display switches to ON and nothing else is happening. This too is normal. When you set your timer to the required cook time it will remain on the display briefly. Then you will see the ON display on your screen. 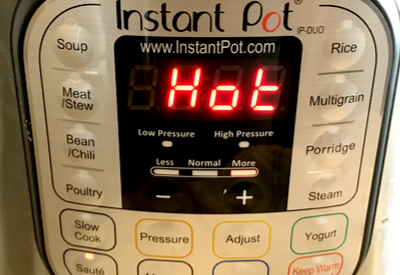 This is period where the Instant Pot is coming to pressure. A steam diverted added to the top of the Instant Pot to prevent steam bathing your cabinets. *Keep this in mind when you are making other recipes. There will always be additional time needed for the pot to come to pressure. And finally, the water test will give you a chance to experience releasing the pressure after the cooking time expires. WARNING – this is the scariest part of the process. In fact, I think I jumped out of my pants the first time I tried it. Moving the knob back to venting should be done slowly. A powerful, steady stream of steam will flow upward. This is where you will not want your Instant Pot directly under your kitchen cabinets if at all possible. The steam will give your cabinets a huge steam bath that in the long term could damage them. But no worries – there are several options to prevent this. Steam being diverted from the venting valve. 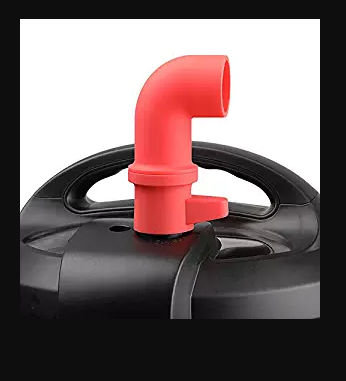 You can purchase a steam diverter that will redirect the stream at a 90 degree angle. Or there are many people who use their Instant Pots on kitchen islands or carts. IMMEDIATELY MAKE A RECIPE – But not just any recipe! Yes, you should dive right in and make a tried and true recipe. But how do you know which one to make? Let me give you a HUGE hint – don’t make anything tomato based. When you are ready to make your first recipe steer away from tomato based recipes. No chili, no spaghetti, and no goulash. You get the point – if the recipe uses thick tomato sauce or mainly diced tomatoes, skip it for now. Don’t worry, you can make them later, but these are not good recipes to try for your first go around. Instead, make a meat or broth based meal. This Chicken Tortilla soup is a great recipe for your inaugural meal. It’s full of flavor and will give you a ton of confidence. However, Baby Back Ribs are hard to beat as well! What typically takes hours to make can be made in the fraction of the time by using the Instant Pot. 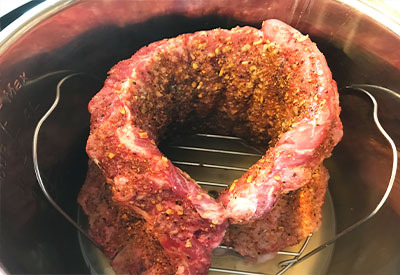 Baby back ribs sitting on the trivet of the Instant Pot. Yes, there really is Instant Pot Lingo that you will need to learn. NPR – natural pressure release. Once the cooking time expires, you let the pot cool down until the pin comes down on it’s own. QR – quick release. Once the cooking time expires, carefully move the knob to the venting position to manually release the pressure through the valve. 5-5-5 method – this term refers to the cooking time – natural pressure release time – and ice bath time. It is most often used in reference to cooking hard-boiled eggs. However, you may also see a two part time reference such as 2-10. This means pressure cook for 2 minutes, with a 10 minute NPR. 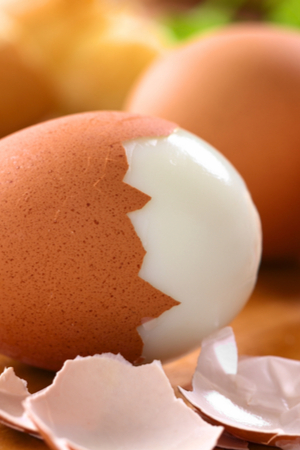 Hard boiled eggs peel easily after being pressure cooked. Once you have gone through the above Instant Pot Beginner Tips there are a few more things that you need to understand. Most recipes that you will see will use the Pressure Cook or Manual button. These two terms are interchangeable. The older Instant Pot models have the Manual button where the newer models have a Pressure Cook button. They do the same thing. Very few recipes will actually use the preset buttons such as Meat, Porridge, and Rice buttons. Unless stated, assume that you will be using the Pressure Cook/Manual button for the time stated. The most common buttons that are used in most recipes are the Manual/Pressure cook and Saute features. And if you have an option for Pressure Cooking on High or Low (some models do, and some don’t) use the HIGH function unless stated. And finally, remember, you must always have a thin liquid in your pot for it to come to pressure. Most recipes that you find have been written for the 6 quart Instant Pot. It is recommended that you use 1 cup of liquid for this size of pressure cooker. However, you can easily adapt most recipes for the 8 quart. And although the official recommendation is to use 2 cups of liquid for this size, it is often acceptable to use 1 – 1/2 cups. And if you have the smaller 3 quart Instant Pot and need to reduce the recipe in half, the cook time remains the same. 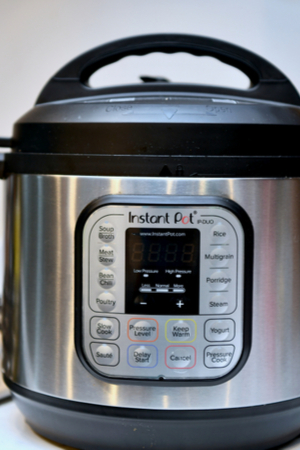 So now that you have the most important Instant Pot Beginner Tips – it’s time to get started!